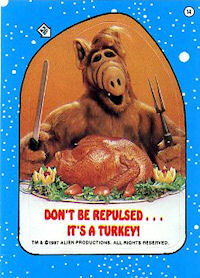 The Hub TV Network celebrates "Fappiano" (the name given to "Thanksgiving" on ALF's home planet Melmac) with a special twelve-hour ALF Thanksgiving Marathon on Thanksgiving Day (Thursday, November 22) from 6pm-6am ET, featuring favorite episodes of the beloved sitcom that the whole family can enjoy. Also, over the holiday weekend, the network offers up a feast of other family fare during a "Black Friday" movie marathon Friday, November 23 from 4pm-4am ET featuring Cats & Dogs, Cats & Dogs: The Revenge of Kitty Galore and Monster House. The holiday weekend concludes on Saturday, November 24 with a lineup of new episodes from several Hub Original series including a special holiday-themed musical episode of Pound Puppies (9 a.m. ET), produced by Hasbro Studios. As for ALF, it features the adventures of Gordon Shumway, a furry, wisecracking alien from the planet Melmac who crash lands into the garage of the Tanner family. The Tanners offer him a home and give him the nickname ALF, short for "Alien Life Form." Created by Tom Patchett (The Carol Burnett Show) and Paul Fusco (also the puppeteer for ALF), the half-hour sitcom rose to popularity in the late 1980s on NBC cementing itself in the pop culture zeitgeist. Ha! Stay tuned next week when we detail all of the Thanksgiving marathons! We can't believe it is that time of year already! For the week of November 19-23, 2012, we have many current sitcom stars and past sitcom stars on TV talk shows! All times listed are Eastern. So get your DVR's (or whatever you use) ready! Ready? Here is all what you need to know for the coming week! Eric Stonestreet (Modern Family) - Watch Eric on Jimmy Kimmel Live! at 12am on ABC. Jennifer Lawrence (The Bill Engvall Show) - Jennifer appears on The Tonight Show with Jay Leno at 11:35pm on NBC. Katie Aselton (The League) - Katie visits The Late Late Show with Craig Ferguson at 12:37am on CBS. Zooey Deschanel (New Girl) - Zooey stops by Late Night with Jimmy Fallon at 12:37am on NBC. Natasha Leggero (Free Agents/Are You There, Chelsea?) - Natasha is a guest on Chelsea Lately on E! at 11pm. Krysten Ritter (Don't Trust the B---- in Apartment 23) - Krysten chats on The Talk on CBS at 2pm ET/1pm CT-PT. Alyson Hannigan (How I Met Your Mother/Free Spirit) - Alyson drops by The Ellen DeGeneres Show, so check listings. Susie Essman (Curb Your Enthusiasm) - Susie appears on Current TV's Joy Behar: Say Anything! at 6pm. NeNe Leakes (The New Normal) - NeNe guest co-hosts Anderson Live, so check your local listings. Amy Poehler (Parks and Recreation) - Catch Amy on The Late Show with David Letterman at 11:35pm on CBS. She will also be on LIVE! with Kelly and Michael, so check your listings. Demi Lovato (Sonny with a Chance) - Demi is a guest on Jimmy Kimmel Live! at 12am on ABC. Miranda Cosgrove (iCarly) - Miranda visits Late Night with Jimmy Fallon at 12:37am on NBC. Olivia Munn (Perfect Couples) - Olivia appears on a repeat of Conan at 11pm on TBS. Jesse Tyler Ferguson (Modern Family/The Class) - Jesse stops by The Ellen DeGeneres Show, so check listings. Zooey Deschanel (New Girl) - Zooey bakes pecan pie on Rachael Ray, so check your local listings. Rico Rodriguez (Modern Family) - Rico discusses his new book, Reel Life Lessons... So Far, on ABC's Good Morning America between 7-9am. Elizabeth Perkins (How to Live with Your Parents (for the Rest of Your Life) - Elizabeth joins the Chew Crew on The Chew on ABC at 1pm ET/12pm PT/CT. Joseph Gordon-Levitt (3rd Rock from the Sun) - Watch Joseph on The Tonight Show with Jay Leno at 11:35pm on NBC. Tim Allen (Last Man Standing/Home Improvement) - Tim visits Jimmy Kimmel Live! at 12am on ABC. Tom Hanks (Bosom Buddies) - Tom appears on a repeat of The Late Late Show with Craig Ferguson at 12:37am on CBS. Amy Poehler (Parks and Recreation) - Amy continues to make the rounds on Late Night with Jimmy Fallon at 12:37am on NBC. Alec Baldwin (30 Rock) - Alec is a guest on LIVE! with Kelly and Michael, so check your listings. Jennifer Lawrence (The Bill Engvall Show) - Tune in to see Jennifer on The Ellen DeGeneres Show, so check listings. Rico Rodriguez (Modern Family) - Rico appears on Joy Behar: Say Anything! at 6pm on Current TV. Ana Gasteyer (Suburgatory) - Ana guest co-hosts Anderson Live, so check your local listings. Natasha Leggero (Free Agents/Are You There, Chelsea?) - Natasha visits The Tonight Show with Jay Leno at 11:35pm on NBC. Rashida Jones (Parks and Recreation/The Office) - Rashida is a guest on Late Night with Jimmy Fallon at 12:37am on NBC. Marilu Henner (Taxi) - Marilu whips up a chocolate almond toffee crunch on Marie on Hallmark Channel at 12pm ET/PT. Jay Mohr (Gary Unmarried/Action) - Gary guest co-hosts a repeat of The View on ABC at 11am ET/10am CT-PT. Miranda Cosgrove (iCarly) - Watch Miranda on LIVE! with Kelly and Michael, so check your listings. Demi Lovato (Sonny with a Chance) - Demi appears on a repeat of Katie, so check your local listings. Kirstie Alley (Cheers/Veronica's Closet) - Kirstie is a guest on a repeat of The Dr. Oz Show, so check your local listings. Florence Henderson (The Brady Bunch) - Florence competes with Marie in TV trivia on Marie on Hallmark Channel at 12pm ET/PT. D.L. Hughley (The Hughleys) - D.L. guest co-hosts Anderson Live, so check your local listings. NeNe Leakes (The New Normal) - NeNe chats with the ladies of The View on ABC at 11am ET/10am CT-PT.